[Diocese of Los Angeles] At least 11 homes of Southern California Episcopalians have been lost in the raging Woolsey and Hill brush fires that displaced some 200,000 residents and burned more than 83,000 acres, with flames racing to the driveways and parking lots of parish properties in Malibu, Oak Park and Thousand Oaks but sparing church buildings. Ten homes of parishioners of St. Aidan’s Church in Malibu, and one home of members of Epiphany Church, Oak Park, were destroyed, according to reports from leaders of the local congregations. Pastoral and practical response continues in a united effort of clergy and laity in the region, joined by Bishop John Harvey Taylor, Bishop Suffragan Diane Jardine Bruce and Canon to the Ordinary Melissa McCarthy, together with the diocesan disaster relief task force, chaired by the Very Rev. Michael Bamberger, rector of Ascension Church, Sierra Madre, and dean of diocesan Deanery 5. Contributions to the diocesan Fire and Mudslide Relief Fund may be made online here. Priority is placed on disbursement of aid to the region’s low-income and otherwise most vulnerable who might not otherwise receive relief amid the disaster. 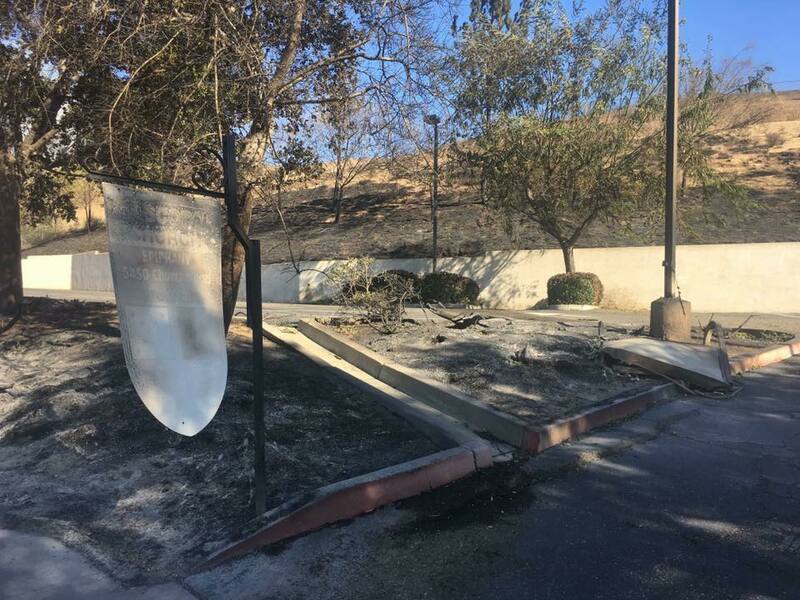 As prayers encouraged by the bishops and clergy ascended across the diocese, firefighters doused the property of Thousand Oaks’ St. Patrick’s Church on Friday, Nov. 9, protecting it from devastation, reported the Rev. George Daisa, rector, who had the evening before been a leader in the city hall prayer vigil responding to the Nov. 8 shooting deaths of 13 at the nearby Borderline Bar and Grill. Sunday services were conducted in the church. In Oak Park, flames charred landscaping and vegetation around Epiphany Church, located on Churchwood Drive, where several homes did not survive the blaze. Neither the church buildings nor the congregation’s vineyard suffered damage, said the Rev. Greg Brown, vicar. Parishioners were able to visit the church and gather for services. In Malibu, the Rev. Joyce Stickney, vicar of St. Aidan’s Church, is mobilizing support for profoundly affected parishioners. She called the sparing of the church buildings and adjacent clergy residence a true miracle. She expressed gratitude for the members of the Malibu Muslim community who have called hourly with offers of food, housing and other support for St. Aidan’s parishioners. Stickney added that that St. Aidan, a seventh-century bishop from the island of Lindisfarne in the North Sea, has been considered a protector against wildfires, his name meaning “fire” in Gaelic. Due to mandatory evacuation orders still in effect, services were not held at the newly remodeled Malibu church on Nov. 11 but are expected to resume on Nov. 18, Stickney said, with a dedication of the renovated sanctuary set for Nov. 25. In neighboring communities including Pacific Palisades, parishioners and clergy had “go bags” packed and ready for evacuation on a moment’s notice. The Woolsey fire follows nearly one year after other devastating firestorms in Ventura and Santa Barbara counties, and the disastrous Montecito mudslide last January. The recent blaze burned concurrently with the Camp Fire in the northern California town of Paradise, where at least 29 people died, 200 went missing, and 6,700 structures were destroyed. The diocese will continue to monitor and report on congregational and diocesan responses to the fire disaster. – Bob Williams is canon for common life in the Diocese of Los Angeles and a former director of Episcopal News Service.